A blast from the past for Valentine's Day. 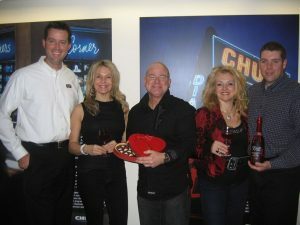 Wine and chocolate, a match made in heaven on 1050 CHUM. The Wine Ladies Radio Show. A match made in heaven! The magic of paring wine and chocolate. Watch The Wine Ladies on their radio show with their guests from Purdy’s Chocolates, Peter Blanchet Chocolate Connoisseur and Peter Higgins Chocolate Scientist as they team up with Magnotta, the award winning winery. Learn about the splendor of two of life’s most enjoyable pleasures… Wine and chocolate pairing. To hear what’s happening on The Wine Ladies Radio these days listen to our Audio Podcast.